If you’re like many e-learning developers, your LMS has prompted many head-scratching (or head-banging) moments. Perhaps your course won’t play or resume in your LMS, or it isn’t tracking properly. Job number one: identify the problem. And to do that, we recommend a handy tool called SCORM Cloud. 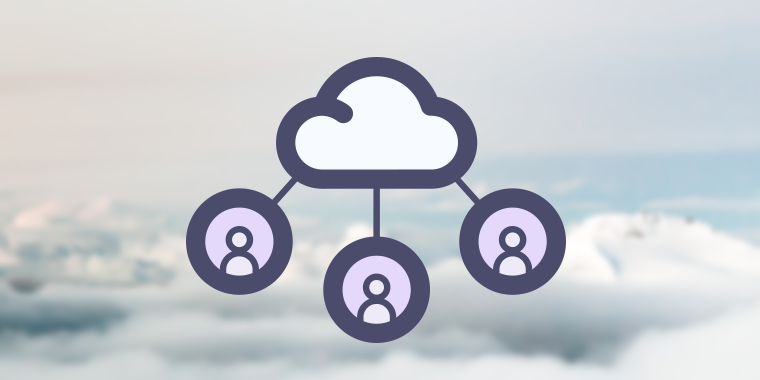 SCORM Cloud is an industry-standard testing engine developed by Rustici Software, an organization that knows a lot about SCORM and helped develop its successor (Tin Can API). Log into SCORM Cloud, then click Choose File or Browse (depending on your browser). 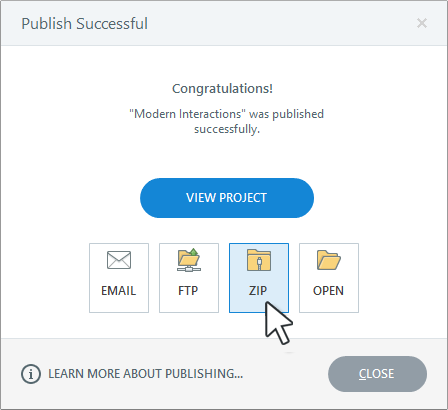 Browse to your zip file and click Open. SCORM Cloud will upload your course and take you to the course home page. It’s possible to launch your course directly from the course home page, but doing so won’t mimic a true learner experience and results won’t show in LMS reports. For this reason, we recommend clicking Invite, followed by Create Invitation. This will generate an unguessable URL that you can use yourself or share with others. Launch your invitation URL in a new browser window. If prompted, enter your email address and name. Your results will be tracked under these credentials. At this point, test your course and attempt to reproduce the problems that prevented it from behaving as expected in your LMS. Watch for display problems of any kind, make sure your content suspends and resumes as you’d expect, and keep an eye out for unexpected behavior in general. 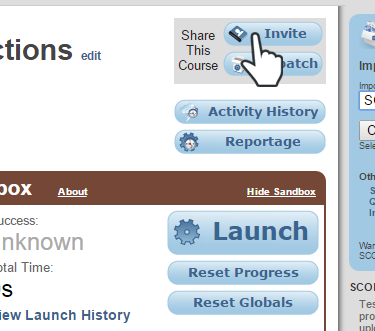 When you’re done testing, exit the course and confirm that your score and status are displayed correctly. Now that you’ve tested your course as a learner would experience it, you can review the SCORM Cloud reports for accuracy. To do so, return to the course details page, click Reportage, then drill down into the available reporting data. 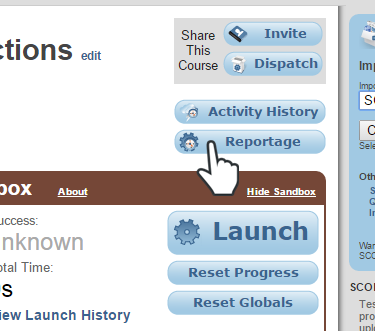 Tip: If your course details page is no longer open, just return to your course library and click the course name. If your course works properly at SCORM Cloud but not in your LMS, open a support case with your LMS provider to troubleshoot the issue. They’ll know how best to help with LMS-specific problems. If your Articulate content doesn’t play, resume, or track correctly at SCORM Cloud, submit a case to Articulate so we can take a closer look. Be sure to include a copy of your project file so we can reproduce the problem. If you have any other suggestions on troubleshooting an LMS, share your thoughts with us and other community members in the comments below. And for more helpful advice on everything related to e-learning, be sure to follow us on Twitter and come back to E-Learning Heroes regularly. Love SCORM Cloud! Thanks, Justin! Wow. This is really great. Thanks for sharing. thanks for the tip on how to use scorm cloud here is my question... I want to work with articulate but my Sakai virtual campus host (longsight) does not support the Sakai SCORM Player plug in. They recommend using scormcloud but our school would have to pay $1000 per month to use the added SCORMCLOUD service... if this is true, why did I buy into articulate to develop for sakai? moodle and other LMS allow for the direct uploading of articulate storyline with no added support for SCORM Viewer to work... and this is what articulate has been representing. so which is it, will articulate do the job or is Sakai's SCORM Player to unstable which mean having to use SCORMCLOUD to make it function. ??? Good Morning, Ron. It sounds like you are saying that your LMS vendor does not support the SCORM protocol and is recommending that you use SCORM Cloud instead. Please let me know if I have misunderstood. Studio and Storyline publish content that is compliant with the AICC, SCORM 1.2, SCORM 2004, and Tin Can API protocols. If your LMS does not support at least one of these protocols, it's possible that you won't be able to track your content within your LMS. Please feel free to send us more details via a Support Case (http://www.articulate.com/support/contact/submit.php) if you'd like, and have a great day! Hi Ron, I can understand your frustration. Sakai doesn't support standard learning management specs like SCORM, so it can't track SCORM-compliant content. It sounds like you can add custom SCORM players to Sakai to overcome this limitation. I'd recommend asking your Sakai administrator to investigate a SCORM add-in. Without an add-in for Sakai, you'd need an LMS that supports AICC, SCORM, or Tin Can API content. Justin is saying that the recommended SCORM add-in for Sakai relies on SCORM Cloud, and the SCORM Cloud service charges more than they're willing to pay. There are two alternative SCORM options for Sakai; one of them is a SCORM player that doesn't rely on third parties; it sort of works (we have it running in Sakai 11), but it leaves a lot to be desired. Justin, thanks for sharing this process. I've been using Cloud for a while, but this is a great one-stop doc to share with my fellow developers who are just getting into building eLearning content. I'm also going to change my process a bit to capture all of the benefits of your process. Good Morning, Chetan. For help integrating your own Learning Management System with SCORM Cloud, I would recommend contacting the awesome Rustici support team here: http://scorm.com/scorm-solved/scorm-cloud-support-that-delights/ Good luck with your project! Hello, We have an LMS, but we are getting requests to deliver some courses via email so users do not have to go to the LMS , register and sign in. I have looked at SCORM Cloud which would work great, but since we drip feed separate lessons weekly, the ongoing monthly cost makes it out of reach for our needs. We have no need for any tracking or reporting on learner usage. Does anyone know a more cost-effective solution similar to scorm cloud? We don't mind development time either, just need to avoid a significant monthly expense associated with our courses which are usually 5-10 individual lessons/modules delivered separately. Would appreciate any suggestions...not finding much when googling, but may be that I'm using the wrong terminology....thanks! Jean, does your organization have their own SharePoint server? If so, and you don't to track, just make available on demand, that's an option. There's a thread on that https://community.articulate.com/discussions/articulate-storyline/uploading-to-sharepoint. I see you also had a response on this thread, https://community.articulate.com/discussions/articulate-storyline/e-learning-content-delivery but I don't see a specific mention of SharePoint as an option there. I've successfully used SharePoint to deliver tutorials that we simply needed people to use and it's really just a matter of minor tweaking to get it to work. The biggest hitch is often making sure there are no blank spaces in the output folder name to get rid of those ugly garbage characters in SharePoint file paths. Hope you've already found your solution (or if not, this helps). I've been introduced to Stormcloud after our LMS - Litmos is having lots of latency issues playing our Articulate content. Stormcloud plays well and after refreshing Litmos the modules do play better but we can't launch as it is. Does anyone have any suggestions? Our mods are around 40Mb only contain audio and no video. We are based in Australia and have been told latency is common for our location. Any one else have some suggestions? Should we move to a CDN? I'm currently looking into Adobe Captivate Prime. I would like to see additional testing support for Mobile devices if possible. Many users of SCORM Cloud use it because they do not have the technical ability to troubleshoot content. It is common, but a mistake to assume that content development vendors will create the content perfectly and will work as expected. I have rarely been satisfied with the results from external vendors. The flow tends to be that the customer gets the "SCORM Package" of the course, they load it into SCORM Cloud, and it passes the testing. It is then uploaded to the required LMS for deployment and then other issues arise unexpectedly. Also, because of the new focus on Mobile, the course may work fine on a desktop tested in SCORM Cloud, but when viewed on a mobile device it is a completely different experience. Inexperienced customers often assume that it will work automatically on Mobile devices. It is also common, and in my opinion a mistake to assume that users will take an E-Learning course on a Smart phone, which is too small to view content. Video is fine to view via Smart Phone and the Smart Phone is used to manage their account, schedule and assign training etc and use a Tablet or PC to actually take a course. I would like to see SCORM Cloud provide users with the ability to see how their course looks and reacts using different Mobile Devices, so that any design work and Instructional design issues can be rectified before deploying. Hey Darren- Thanks for the comment. SCORM Cloud currently supports launching of mobile content. Personally, I use xCode (https://developer.apple.com/xcode/) when testing/troubleshooting client courses. As well as the debugging offered by Safari (https://webdesign.tutsplus.com/articles/quick-tip-using-web-inspector-to-debug-mobile-safari--webdesign-8787). Is ScormCloud free for testing? I published a scored test in Articulate Storyline 2 as SCORM 1.2 for our LMS. Reporting and tracking options are set for results slide (80% passing score) and Passed/Failed. Two attempts are set at the question level. The Results slide includes options to review or Exit. The LMS is allowing users to retake the test multiple times. I thought the Passed/Failed setting would prevent this. LMS vendor told me it is a SCORM issue rather than an LMS settings issue. I uploaded one of the tests to SCORM Cloud and failed it - completion status is indicated as incomplete. Any thoughts? Thank you. Hello All, I am using Articulate Storyline 3.5 Tool. For LMS using https://cloud.scorm.com server. below issue with score. On first attempt my score is 90% and then after i try to get 100%, but in second attempt my score is 80% but in cloud scorm still its showing me 90% Score. Can you please let me know the exact reason why its not showing me latest score. Hi Rahul, I'm sorry you're having issues! think the best thing to do here would be to get in touch with our support team directly: https://articulate.com/support/contact/case Let me know if there's anything I can do to help in the meantime! HI there. Just wanted to let you know the link http://scorm.com/scorm-explained/ - "knows a lot about SCORM" no longer works. Thanks for pointing that out! We're working on restoring it.